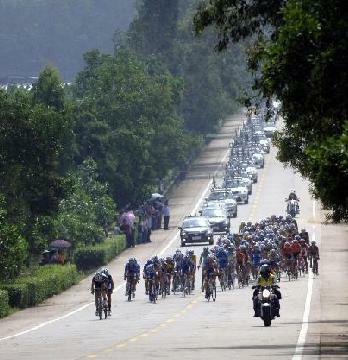 The time-honored Giant Asia Racing Team from Chinese Taipei and MTN Qhubeka from South Africa reached Sanya city of South China’s Hainan Province, which will host the 2011 Tour of Hainan International Cycling Race from Oct. 20 to 28. The other 19 teams will arrive at Sanya on Tuesday. Affected by the strong typhoon "Nesat" and the tropical storm "Nalgae", the cycling road in Wu Zhishan city in southern Hainan was seriously destroyed. So the relevant authority had to change the original Wu Zhishan cruising into the race from Wu Zhishan to Xinglong. 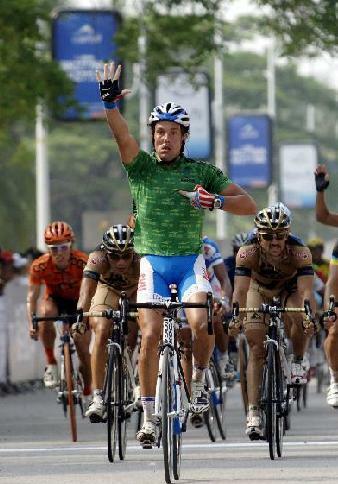 The opening ceremony of 2011 Tour of Hainan will be held in Sanya at 7:00 pm on Oct. 19, the day before the race formally opens. A total of 21 top teams from all over the world and a total of 147 cyclists will take part in the race, which will cross all 18 cities and counties with the total length of about 1400 kilometers.